After countless versions on almost every gaming platform, the DSiWare service gets yet another reincarnation of the ancient Chinese tile matching game in 3D Mahjong. Fully equipped with a variety of play modes and 3D rendered game boards, this new title brings the classic game of Mahjong Solitaire to the table without forcing too much on the player. The audio and visual quality of 3D Mahjong are above par compared to what we've come to expect from a DSiWare title. The latter is the most impressive part of this game; one of the DSi’s screens displays a beautifully coloured and shaded 2D image of your board, while the other shows a fully 3D-rendered version. 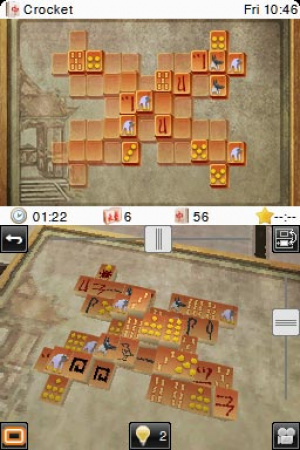 Whichever you choose to have on the bottom screen is your actual game board, and the top displays an inverted version which shows all of the pieces that you have already collected as well as other information such as a clock, the number that you have left to match, and the current date and time. If ever you happen to get bored with the visual design, you can customise it to your liking with six different sets of tiles and just as many background images. The soundtrack is a crisp collection of Chinese influenced beats, and while all of them may be repetitive and not offer up very much variety, they set the mood for playing Mahjong well and can leave you in an almost trance-like state. 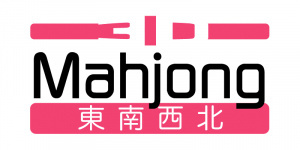 3D Mahjong offers up 50 different game boards across three difficulty settings, making it very accessible for players of varying skill. Playing on the easy or medium levels provides a great introductory Mahjong experience for beginner players. The hard stages, on the other hand, are not too challenging, but difficult enough to keep the seasoned vets coming back for more. If you are having trouble and just can’t seem to find a match, you're allowed up to three hints in each level. It is optional whether you use these or not, but when you’re stuck, it can be helpful to maintain the flow of the game. Aside from regular Mahjong Solitaire, this title also features two other single player modes: Memory and Matching. The first involves the player flipping over face-down tiles to reveal what is underneath, trying to find all of the matching pairs. Matching is similar, except that all of the tiles are already face-up, and it is the player's job to simply select the ones that match. Both of these alternate modes feel like watered-down mini-games, but the main event has enough variety and replayability to allow these other two to be looked right over. Unfortunately, there is a complete lack of multiplayer in 3D Mahjong. This game offers two different control schemes, the first of which uses the directional pad to move around the board and the A button to select matching pieces. While this is an effective input method, it can make the pace feel very slow, and it's sometimes frustrating trying to land your cursor on the actual piece for which you're aiming. The other option is to use the stylus and touch screen for everything. This is much quicker and feels a lot more natural, but sometimes the game will misread which piece you try to select. This problem is especially prevalent when playing in the 3D mode, but it is possible to very quickly get used to the touch controls and know exactly where to aim. The amount of replayability in 3D Mahjong is endless. With 50 different formations and pieces that are always randomised, this game is nearly impossible to master. While the Memory and Matching modes offer next to nothing to return to (unless you’re adamant about always getting an increasingly lower time), they could be entertaining for younger players who can’t quite grasp the rules of Mahjong. When you get right down to it, 3D Mahjong is simply a fun game in its purest form. 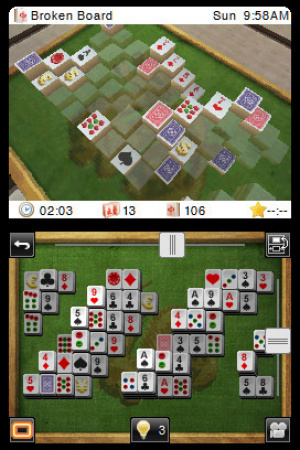 The true beauty of 3D Mahjong is that it is simply the classic game with a lot of variety. There are no gimmicks and no unnecessary plot lines that try to make it feel new and original. If you’re looking for an excellent solo Mahjong experience, or just looking for a game that can keep you entertained almost limitlessly whether on the bus or at home, then 3D Mahjong is a must have for your DSiWare collection. Sounds like a purchase to me! the game is pretty fun, i have been playing it a lot since i downloaded it! Hi, is this like Shanghai 11 Dragons eye (like on my old computer) I think I will download this as I can't stand being without my Mah Jongg. Also, will this be compatible with my windows 7? Just tell me when you have it ready and I will download. @Will_Ireland This isn't a computer game, it's available for DSiWare, the download service on Nintendo's handheld system, the DSi. It's available already in the US and UK, so you should be ready to download it as long as you have the system. Whether or not you are running Windows 7 on your computer should not be an issue as the DSi and your PC do not have to communicate to play this game. I remember playing Mahjong for the first time. I had no idea what was going on, but later I started to like it. I have no idea how Mahjong works. I really wish the west learned to tell the difference between Mahjong (a 4-player tile game) and solitare Mahjong (this). I.E This game is not Mahjong. I thought that this game was a lot of fun. And my girlfriend keeps coming over and stealing my DSi so she can play it. She makes it difficult for me to get these reviews done. Any stats, gameplay records, profiles, etc? The main stat is it records your fastest time for each of the 50 levels. This looks super cool! Mahjong is one of my favorite classics.